Tim Challies wants to not die, so he’s checking out a gym. Understanding how out of place and awkward people feel is the first step to putting them at ease. Pastors, greeters, church communicators and lay people need to learn some empathy for church visitors. In fact, Jonathan shares his own story of trying out a CrossFit gym and feeling equally lost (you’re not alone, Tim!). We can’t all join gyms for that experience, but we should find our own equivalent. Walk into a biker bar, volunteer in a high school or march in a protest you wouldn’t normally join. Find something that pushes you outside your comfort zone, then wallow in that uncomfortable feeling. I don’t want to get too weird, but it’s kind of like a guy walking into Victoria’s Secret. Then realize that’s what it’s like when visitors walk into your church. 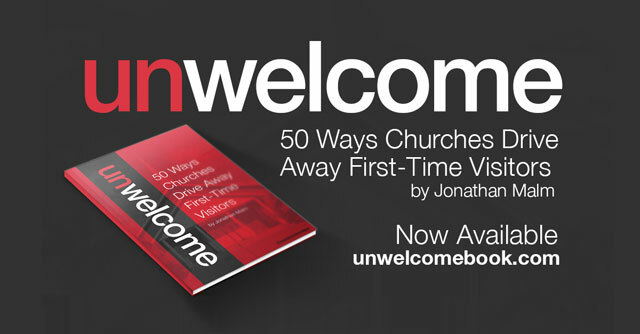 Learn more about Unwelcome: 50 Ways Churches Drive Away First-Time Visitors. You can also grab some free sample chapters. Check out our entire collection of resources to help make church visitors feel welcome.